The Variety of Life can be read at many levels. 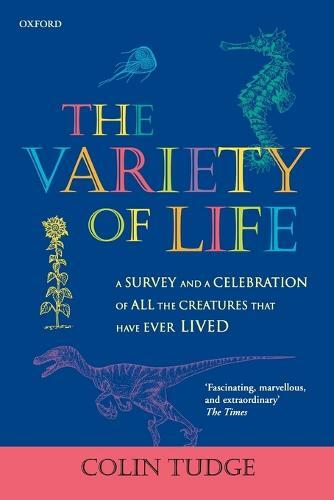 Not least it is an extraordinary inventory - an illustrated summary of all the Earthly creatures that have ever lived. Whatever living thing you come across, from E coli to an oak tree or an elephant, The Variety of Life will show you what kind of creature it is, and how it relates to all others. Yet there are far too many creatures to present merely as a catalogue. The list of species already described is vast enough - nearly two million - but there could in reality be as many as 30 million different animals, plants, fungi and protists - and perhaps another 400 million different bacteria and archaea. In the 4,000 million years or so since life first began on Earth, there could have been several thousand billion different species. The only way to keep track of so many is to classify - placing similar creatures into categories, which nest within larger categories, and so on. As the centuries have passed, so it has become clear that the different groups are far more diverse than had ever been appreciated. Thus Linneus in the 18th century placed all living things in just two kingdoms, Animals and Plants. By the 1950s this had become five kingdoms - with fungi, protists, and bacteria hived off into their own separate groups. But leading biologists today acknowledge three vastly different domains, each divided into many kingdoms - so that animals and plants, spectacular though they are, are just a fragment of the whole. The Variety of Life explains the means by which systematists have attempted such a mammoth classification of so many various creatures - which in turn leads us into some of the most intriguing and knottiest areas of modern biology: evolutionary theory, molecular genetics, and the history of biological thought. Finally, however, The Variety of Life can simply be seen as a celebration. We should all share Miranda's pleasure in Shakespeare's Tempest - 'How many goodly creatures are there here!' - and feel, as she did, what a privilege it is to share this planet with such wonders. Their fate is in our hands; and first, we must begin to appreciate them.